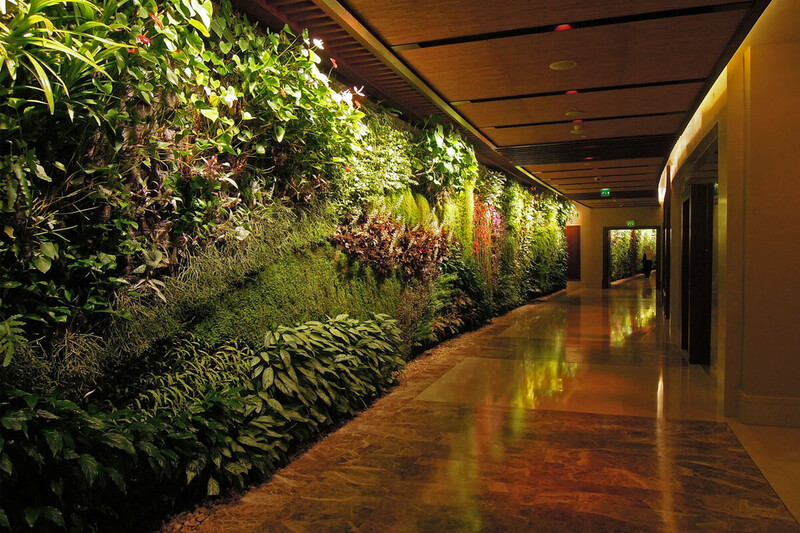 All over the world, vertical gardens are being used on indoor and outdoor walls, on fences, and even as art installations. 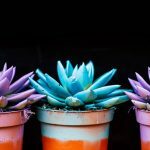 Some vertical gardens stand out from the rest due to their beauty and size, making them the best vertical gardens one will ever see. 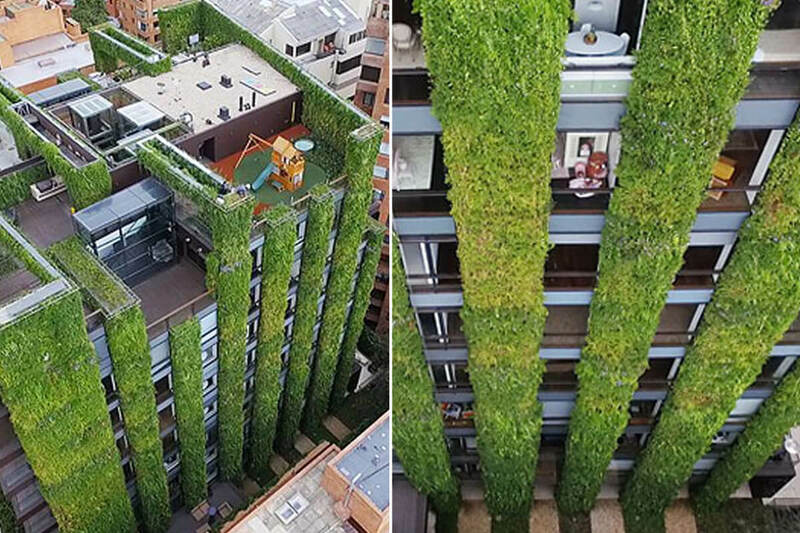 But what would you call the “best vertical gardens”? 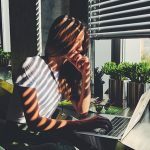 What factors would you take into consideration? Obviously, the visual appearance of a vertical garden is the first factor that impacts the judgments and opinions of its viewers. A vertical garden is made up of 3 parts – a metal frame, a PVC layer and a layer of felt. Plants can be installed on the felt layer as seeds, cuttings or grown plants. 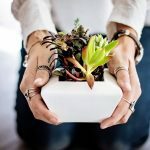 The entire weight of a vertical garden, including the living plants and frame, is usually lower than 30 kg per square meter. 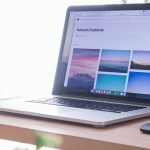 Due to its versatility, easy installation and not so heavy exterior facade, many modern structures are inspired by this concept. 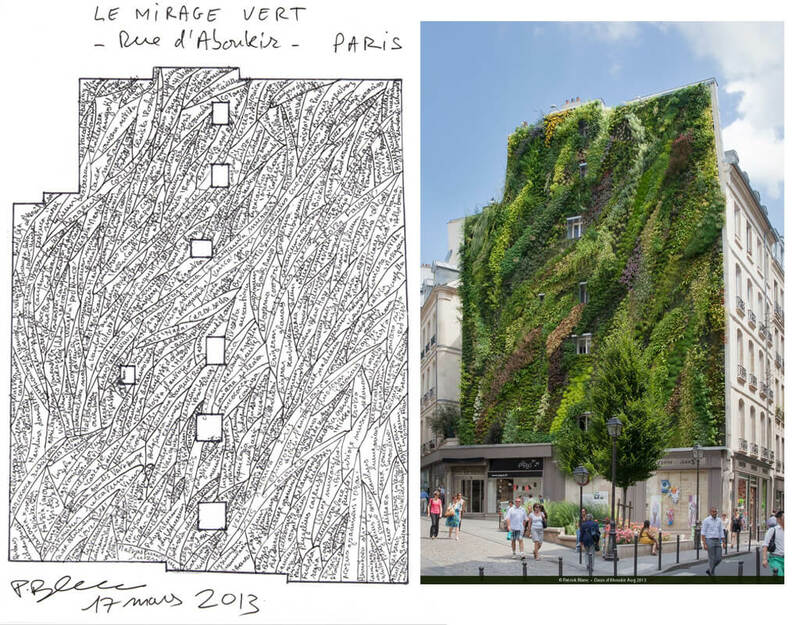 Patrick Blanc, a French botanist and designer, had invented the concept of the vertical garden and has been on a quest to build green walls across the planet with his plant-based creations for the last 25 years. 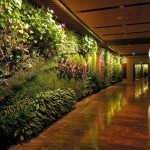 Most of his green wall creations have topped this list of best vertical gardens around the world, along with a few others. Original sketch of the design by Patrick Blanc. This project, installed in the heart of Paris, is one of 250 vertical gardens that Blanc has conceptualised and built in public and private, indoor and outdoor spaces around the globe. Patrick Blanc called this creation “a hymn to biodiversity”. Designed with over 7,600 individual plants from 237 different species, the lush green vertical garden took about 6 weeks to complete. 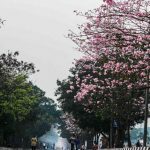 Because of the colourful vegetated wall, the neighbouring outdoor public space has become a tourist place, even having its own Facebook page! 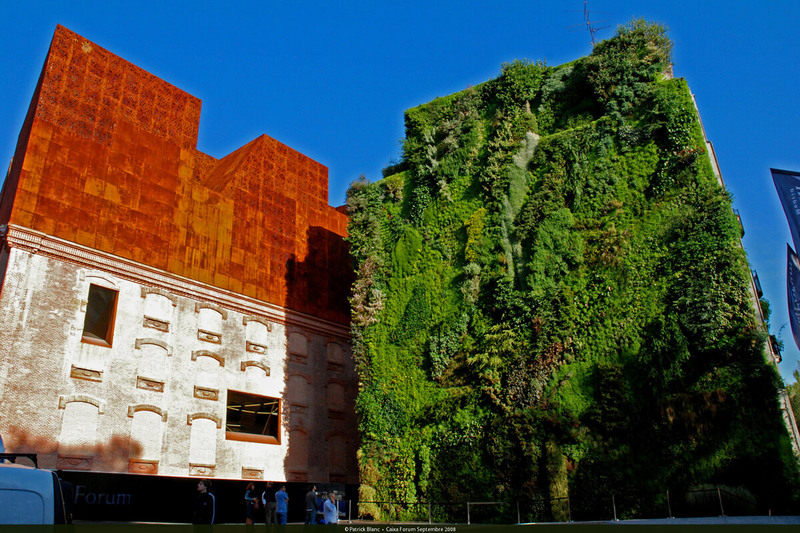 Madrid has been graced with the beauty of this magnificent vertical garden designed by Patrick Blanc in 2008. The biowall contrasts beautifully with the deep orange facade of the adjacent building. Caixa Forum is a cultural and arts centre comprising of 2 buildings. In between the 2 buildings, a gathering plaza has been created. This space is shadowed by the adjacent buildings from the burning sun. The vertical garden takes up the exterior wall of the building, overlooking this plaza. 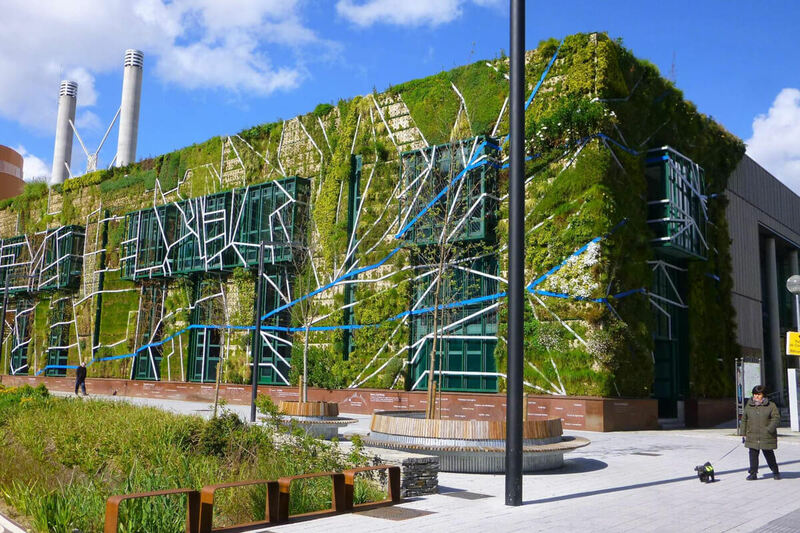 The biowall is 4 storey high, made with 15,000 plants of more than 250 different species! The EmQuartier shopping mall in Bangkok is an architectural landmark. 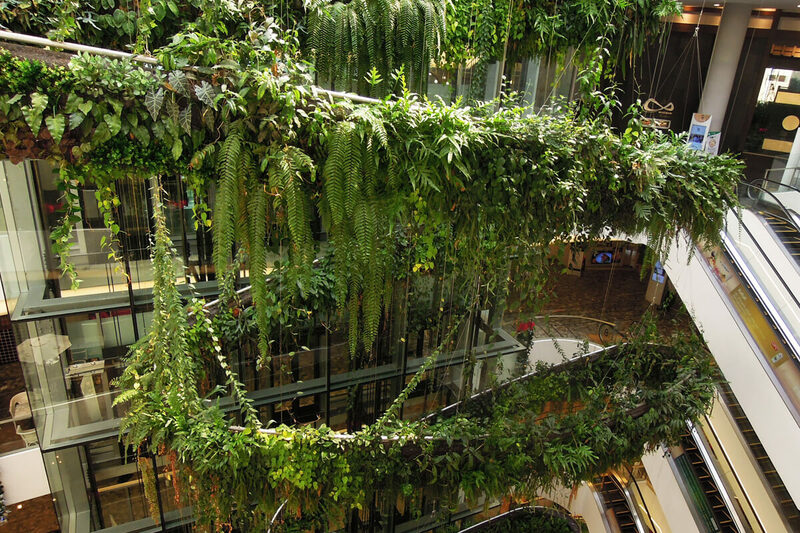 It has the world’s largest vertical garden as a chandelier, designed and conceived by Patrick Blanc. The rainforest chandelier is the longest free hanging structure in the world, 103 metres long, completely covered by wild exotic plants. Palacio de Congresos Europa, located in Vitoria-Gasteiz, Spain, is a conference and exhibition centre that recently underwent renovation. This renovation of the building was mainly done to beautify the building’s exterior facade and add some “extra-green” to the surrounding landscape. The building’s facade also features a living installation that uses more than 33,000 plants of 70 different species growing on a total surface area of 1,492 sq.m. The environmental renovation of the centre was developed to create a carbon neutral building that is efficient in its use of resources, including building materials, water, and energy use. One Bligh Street in the CBD features a 377 sq.m. 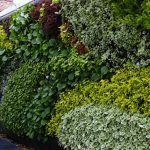 green wall – the largest vertical green wall in Australia. 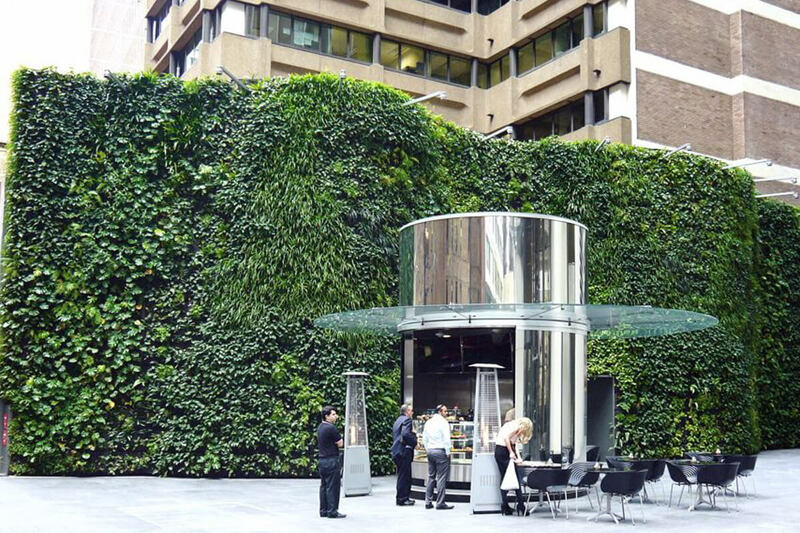 Fytogreen, Australia’s leading botany specialists, was commissioned to deliver the project, with the green wall requiring both shade and wind tolerant plant species. 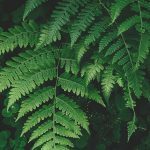 The ongoing sustainability of this special project is being researched to nurture and investigate suitable plant species for the ongoing maintenance of the green wall. Santalaia is a high-end multi-family residential building situated on the eastern edge of the densely populated Colombian capital of Bogota. 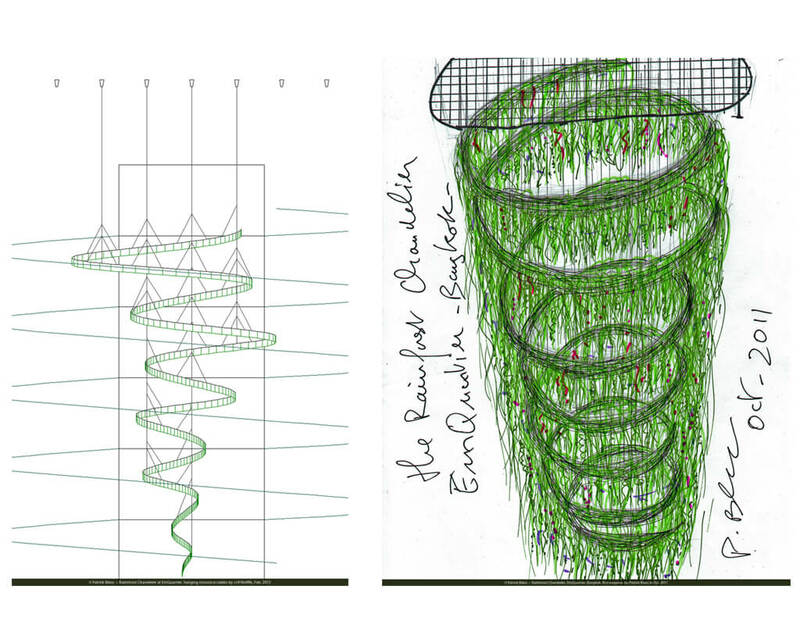 In 2013, architect Exacta Proyecto Total approached Groncol which is vertical garden and green roof designing and installation company, with the idea of having the structure entirely covered with plants. 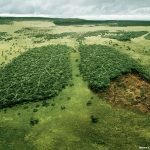 A vertical garden of this size produces enough oxygen for 3100 people every year, filters more than 2,000 tons of harmful gases, and catches more than 881 pounds of dust every year. Even watering doesn’t put a drain on resources because the irrigation process has been cleverly designed to use up waste water. The Santalaia building uses water from the apartments’ showers for irrigation! 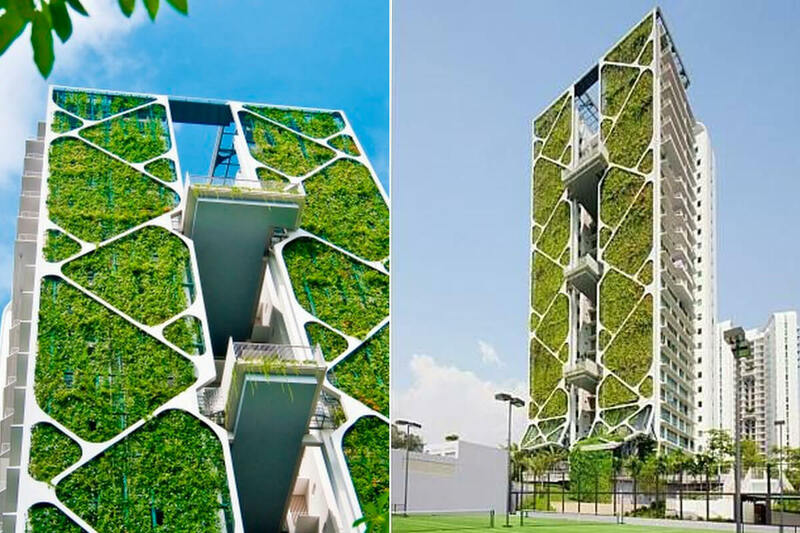 Upon completion in 2014, this Singapore condominium set a Guinness World Record that year for being the world’s largest vertical garden. Tree House is a residential project that consists of 4 towers. 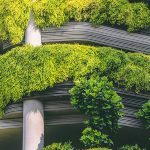 Each 24-storey high tower is encased in lush foliage that filters pollutants and carbon dioxide out of the air to reduce the residential estate’s carbon footprint. The wall measures a staggering 2,288 sq.m. and saves more than half a million dollars in energy and water costs every year through automated irrigation systems. While the green wall removes greenhouse gas emissions to minimise heat absorption, state-of-the-art windows make use of heat-reducing technology, keeping homes cool throughout the day. This living art form of vertical gardens has expanded the potential design permutations of architecture in the middle east. Apart from the skyscraping towers and the very famous iconic structures of Dubai, vertical gardens are adding on to the city’s design landscape. The corridor walls of Sofitel Palm Jumeirah are converted into a biowall. The hotel has covered parts of its interiors as well with such vertical gardens, adding up to a total of 24 vertical gardens with 170 different species of plants and wildflowers!